Recently, Chief Planner of the City of Dallas Historic Preservation Section Mark Doty ran across a collection of 35mm slides in our storage. Unsure of what was on them or if they would be useful, he passed them along to Senior Planner Jennifer Anderson to scan. Imagine our surprise when we discovered that the slides contained dozens of original photos of Dallas from the 1970s and 80s, many of them featuring prominent landmarks around downtown. Here are a few of our favorites. Enjoy! 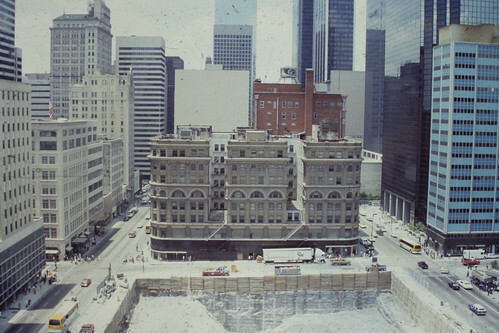 Dallas City Hall and plaza under construction (1974). Left side: Unfinished City Hall site; Right side: City Hall unfinished facade. Dallas City Hall is a Brutalist Style architectural masterpiece designed by renowned architect I.M Pei. The building and plaza were completed in 1978. We were thrilled to discover three slides that show City Hall under construction in photos dated 1974. The above photo on the left side is an aerial view of the unfinished building, reflecting pool, and plaza. The future site of Dallas Public Library is also visible in the upper right corner of the photo (then a parking lot). Click here to learn more about the architecture of Dallas City Hall. The Baker Hotel was located across the street from the Adolphus Hotel where Whitacre Tower in One AT&T Plaza sits today. It was one of Dallas’ finest hotels from the time it opened in 1925 until its closing in 1979. The hotel hosted prominent members of Dallas society, debutante balls, society galas, movie stars, and even past presidents. The building was also the home of WFAA Radio, the Peacock Terrace, and the Crystal Ballroom. It closed in 1979, and its interior items – everything from chandeliers to doorknobs – were sold at auction. Southwestern Bell Telephone Company demolished the hotel on June 29, 1980 to make way for a new office tower. We found eight photographs of the Baker Hotel ranging in dates from 1972 to 1980 in the slide collection. 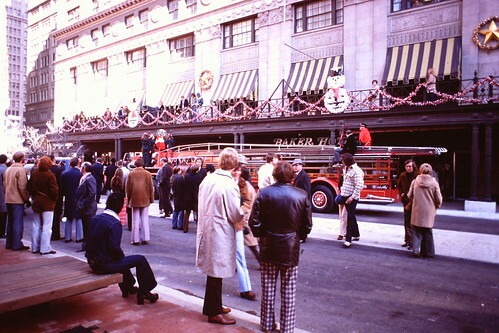 This photo is from December of 1974, not long after the hotel was renovated following a large fire on the top floors. View the full photo set here. Can you imagine the Dallas skyline without Reunion Tower? 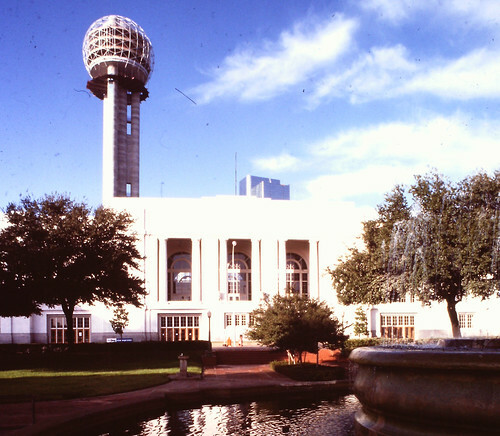 Since its completion in 1978, “The Ball” has become an iconic symbol of Dallas. The structure was part of a major redevelopment project that involved construction of Reunion Tower, the Hyatt Regency Hotel Complex, and renovation of the adjacent Union Station. The 561 foot tall tower has an observation deck, a Wolfgang Puck restaurant, a cafe, and a gift shop. In the beginning, it functioned as a broadcast tower for KOAX-FM, now KRLD-FM 105.3. The above photo is of Reunion Tower under construction in 1977, prior to the installation of glass. New York native Ruben Goldstein opened Honest Joe’s Pawn Shop at 2524 Elm Street in 1931. The shop was a Deep Ellum institution, and his customers included everyone from neighborhood folks to celebrities. Even Jack Ruby was a customer, and he purchased many of his items for his Carousel Club here. Goldstein’s schemes could be eccentric at times, and one marketing stunt even landed him on the Warren Commission report following the JFK assassination. Goldstein, after witnessing the crowds lined up downtown to catch a glimpse of President Kennedy, mounted Honest Joe signs and a decommissioned machine gun to the roof of his car. He was stopped by the FBI before reaching the West End, but the stunt is still discussed by conspiracy theorists today. Goldstein passed away in 1972, and his wife Bess ran the shop until it closed in 1985. The existence of a secret third floor, long rumored to be a former Speakeasy during the Prohibition Era, was confirmed in the 1960s. 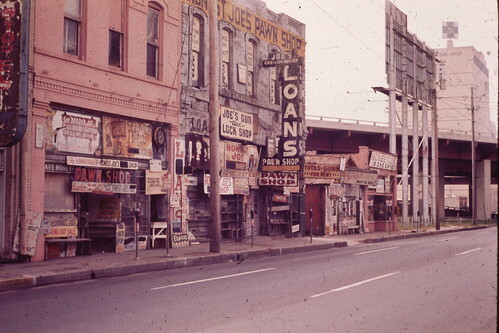 The photo above shows Honest Joe’s in 1974, two years after his passing. The Wilson Building, a Renaissance Revival building constructed in 1904, is fully visible in this photograph that was taken during the construction of the Comerica Bank Tower. The slide was undated, but was taken sometime around 1985 since that is when construction began on the tower. The Wilson Building originally housed the Titche-Goettinger Department Store, and later HL Green’s. It also contained office space for various businesses. It is now a mixed-use building featuring restaurants and 143 loft-style apartments. Kalita Humphreys Theater at 3636 Turtle Creek Blvd was designed by Frank Lloyd Wright, one of America’s most well-known and beloved architects. It was completed in 1959 for the Dallas Theater Center. Wright’s design principles and methodology of “organic architecture” included a holistic approach to design that was sympathetic to the nature of site, structure, and materials. 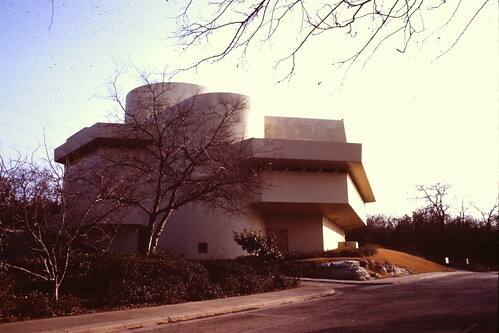 All of the basic elements of Wright’s design philosophy are exhibited in the Kalita Humphreys Theater, including the overall horizontal lines punctuated by a central vertical form, and the incorporation of geometrical shapes such as the hexagon and spiral. The photo above was taken in 1972. The theater is a designated City of Dallas Landmark. The Missouri-Kansas-Texas railroad, also called The Katy or the MKT, followed a north/south route. It entered Texas from the north in modern-day Denison on Christmas Day in 1872. Key stops along the route included Kansas City, Dallas/Fort Worth, Waco, San Antonio, and Houston/Galveston. MKT merged with Union Pacific in 1988. 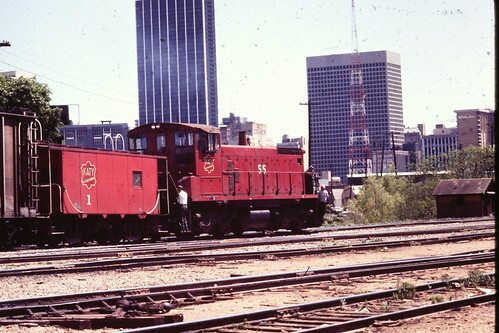 This photo is believed to be from the mid-to-late 1970s, and the train is headed south in roughly the area where American Airlines Center is located today. Of the three tallest buildings in the photo the old First National Bank building is the tallest, then One Main Place in the center, and the Holiday Inn (now Holiday Inn Crown Plaza) building is on the right. Little Mexico was located on the northern edge of downtown Dallas in what is now called Uptown. The communities of Little Jerusalem, Frog Town, and Goose Valley were already established in this area when thousands of Latin Americans fleeing the Mexican Revolution began to settle there in the 1910s. 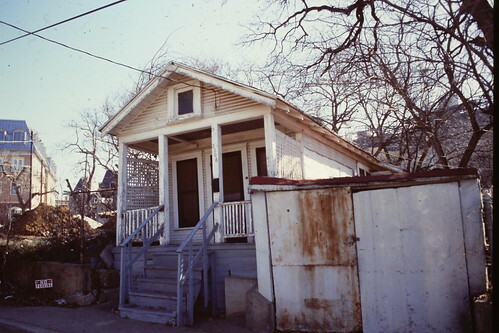 Many Jewish residents had already begun the process of relocating to South Dallas, so by 1920 the neighborhood was predominately Hispanic. The neighborhood then became known as Little Mexico, and many significant structures and businesses were built during this time. Very little remains of the former communities or of Little Mexico, and the shotgun pictured in the photograph was likely demolished as well. The address and date of the photo was not noted on the slide, but is thought to be from the mid 1980s when remnants of Little Mexico still existed. Click here to view the full set of our slide scans or to see full size versions of the above photos (dates vary).